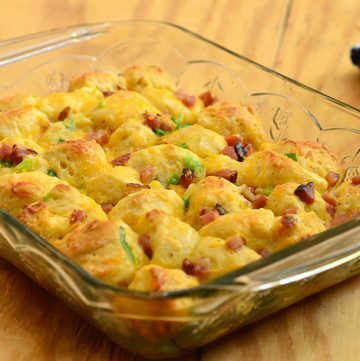 Biscuit and Ham Breakfast Bake with diced ham, tender biscuits, eggs, and cheese is a hearty casserole perfect for breakfast or brunch. Can be made ahead for busy work days! We’re big fans of refrigerated biscuits around here and at any given time, I have a tube or two in the fridge handy for all sorts of sweet and savory (this bubble pizza is a must-try!) treats. 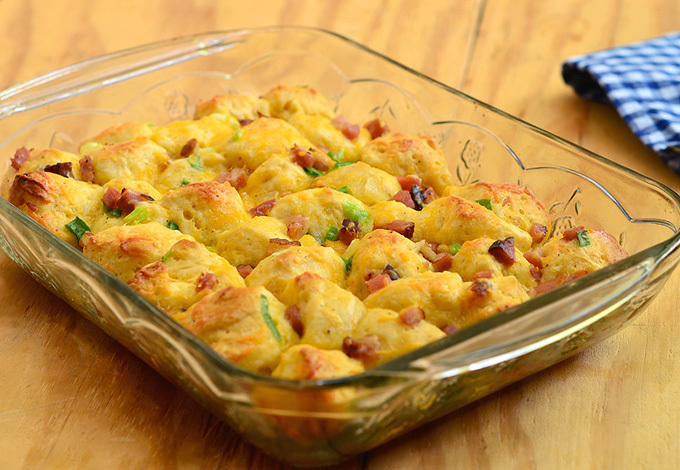 Of all the delicious things we are able to make with biscuits, this biscuit and ham breakfast bake is, by far, my hands down favorite. 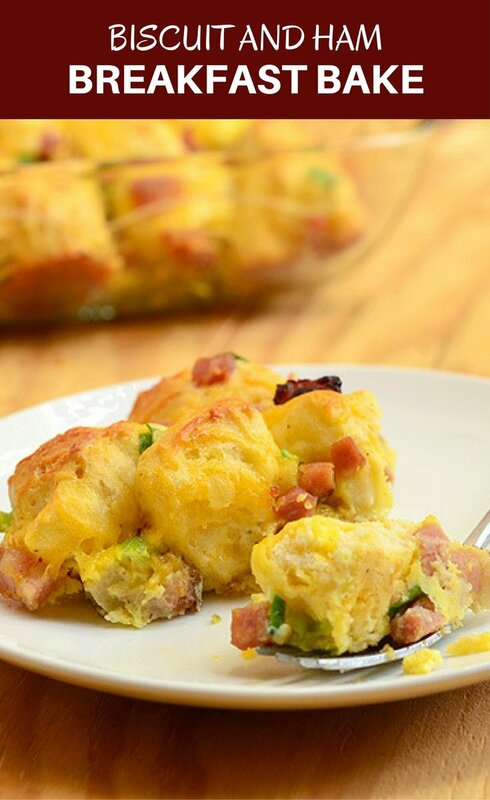 Loaded with diced ham, eggs, and cheese, it’s hearty and delicious for breakfast or brunch. 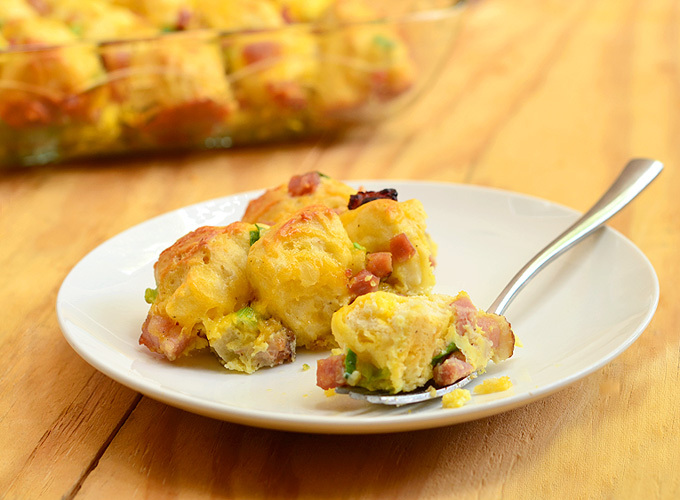 This ham egg and biscuit breakfast casserole is easy to prep and can be made ahead of time which is perfect for busy weekdays or for feeding a crowd. Just keep refrigerated and adjust the cook time 3 to 5 minutes. This breakfast casserole recipe is customizable, too! Feel free to swap or add to the ham and green onions with whatever you have on hand. Crumbled sausage. crisp bacon, chopped sweet peppers, mushrooms, roasted garlic, canned Rotel tomatoes, ricotta cheese, sauteed spinach are just a few of the amazing possibilities! In a skillet over medium heat, heat oil. Add onions and cook until limp. Add ham and cook, stirring occasionally, until lightly browned. With a slotted spoon, remove from pan and drain on paper towels. Separate biscuit dough and cut each into quarters. In a bowl, combine eggs, milk, hot sauce, and salt and pepper to taste. Whisk together until frothy. Add biscuit pieces and toss to coat. Add green onions, cheese, ham and gently fold together. In a lightly-greased baking dish, pour the mixture and arrange biscuits in a single layer. Bake in a 350 oven for about 20 to 25 minutes or until golden. Remove from oven and allow to stand for 3 to 5 minutes. Cut into squares or spoon onto serving plates. Serve warm. I made this dish today and my family loved it! Thanks for the recipe! Thanks, Stacy, for the feedback. Glad your family liked it. This looks like such a delicious family breakfast! I will definitely have to try this the next time I have everyone together! These look amazing! I’ve been wanting to try biscuit since becoming obsessed with American foods as a teenager, and this recipe is definitely swaying me to bite the bullet and get a try. Unfortunately biscuit dough isn’t a thing here in England, but I’ll have to see if I can find a recipe to make that, too, so I can properly give this a go! Thanks for sharing. I’ve never had biscuits like this before. I am definitely going to try this recipe. YUM! Please do! It’s so easy and makes a hearty breakfast.